From her early childhood, Beyoncé Knowles wanted to be more than a performer: she wanted to be a superstar. By the age of twenty-one, she had reached that goal, becoming world-famous not just in her chosen field of singing but also as an actress. After attaining wide success with the R&B group Destiny's Child, Knowles broke out on her own, releasing her solo debut, Dangerously in Love, in 2003. 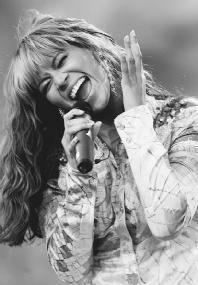 The single "Crazy in Love," featuring her boyfriend, rapper Jay-Z, was one of the biggest hits of the summer of 2003. The song propelled the album to multimillion-unit sales and earned Knowles a number of awards, including a Grammy Award and an MTV Video Music Award. In 2002 she displayed her acting abilities in the third installment of Mike Myers's Austin Powers series Austin Powers in Goldmember, starring as Foxxy Cleopatra. The following year she appeared opposite Academy Award–winning actor Cuba Gooding Jr. in The Fighting Temptations. Knowles also nabbed a number of high-profile endorsement deals, acting as a spokesperson for Pepsi and for the cosmetics company L'Oréal. For all her money, fame, and critical recognition, Knowles has managed, according to friends, family, and even journalists, to hold on to her warm, genuine nature. Beyoncé Giselle Knowles was born and raised in Houston, Texas, along with her younger sister, Solange, who would later follow her sister into the entertainment industry. Her father, Mathew, worked for many years as a sales representative selling medical equipment, while her mother, Tina, worked in a bank and later opened her own beauty salon, which became one of the most successful salons in Houston. As a young child, Knowles was shy and had few friends. Her parents signed her up for a dance class when she was seven years old, "to make friends more than anything else," as Tina Knowles described to Essence. The first time Beyoncé's parents saw her perform, they were stunned. "When we saw her on stage for the first time, it was incredible. I'd never seen her so alive and confident," Tina recalled. Beyoncé had found a way to break out of her shyness, and along the way she discovered she had real talent. She began singing in—and winning—local talent contests, and soon her parents realized that performing made their daughter happy, and that she was gifted enough to have a shot at success. "My main accomplishment is achieving peace and happiness. Sometimes you think it's success, and you think that it's being a big star. But I want respect, and I want friendship and love and laughter, and I want to grow." Talent runs in the Knowles family. Right on the heels of Beyoncé is her little sister, Solange, who, like her more famous sibling, has wanted to be an entertainer for as long as she can remember. She started her life as a professional performer at age thirteen when she began touring with Destiny's Child as a backup dancer. She broke into the music business soon after, releasing her first album, Solo Star, in early 2003. Solange has also participated in the theater since early childhood, acting in a number of plays. She made her big-screen debut in 2004's Johnson Family Vacation, appearing with Cedric the Entertainer, Vanessa Williams, and rapper Bow Wow. Solange was born on June 24, 1986, in Houston, Texas. She performed in a children's dance troupe at the age of four and can clearly remember loving the attention and admiration she got from the audience. She was hooked, and knew from that moment on that she wanted to entertain people. She began writing songs since the age of seven, and at age thirteen she asked her parents to allow her to pursue a professional singing career. They suggested she wait until she was a little older. That same year, when one of the backup dancers for Destiny's Child had to drop out just before the start of a tour, Solange was chosen to fill in. She embarked on a two-year worldwide tour, accompanied by her father, the manager of the group, and her mother, the group's stylist. Her parents watched her closely, observing how Solange handled the hard work and pressures of being on tour. By its conclusion, they had decided their younger daughter was mature enough to begin her own singing career. Solange knew her way around a recording studio, having spent time with her sister when Destiny's Child was recording. She had learned how to write and produce songs, and she put those skills to use in crafting her debut album, Solo Star. With songwriting and production help from such notable artists as the Neptunes, Timbaland, and big sister Beyoncé, Solange created a pop R&B album that showed the influence of reggae, hip-hop, and even country. The album features guest appearances from Da Brat, Lil' Romeo, and B2K. In early 2004 Solange, at age seventeen, took a break from her career path to wed Daniel Smith, a college football player from Houston. With the rest of the Knowles family looking on, the couple were married in the Bahamas. was also a member of Girl's Tyme, and when Rowland and her mother encountered financial problems, the Knowles family took Kelly in. The members of Girl's Tyme felt that success was close by when they participated in the television talent competition Star Search in 1992, but they did not win the contest. Believing that he could improve their chances of getting a record deal, Mathew Knowles became the group's manager and persuaded the group not to give up on their dream. Eventually he quit his job to manage the group full-time, taking them to talent competitions in Los Angeles, California, and elsewhere. He poured his energy, his time, and the family's money into the project, forcing the family to sell their house and move into an apartment. The stress of their reduced circumstances caused problems in Tina and Mathew's marriage. "I felt like the group was more important to him than his family," Tina told Essence. The couple separated for a short period, but soon realized they were miserable when apart. They reunited and have been together ever since. The girls' group, performing under such names as Somethin' Fresh, the Dolls, and Destiny, completed a demo recording to send to record labels. They performed wherever they could, practiced singing and dancing all the time, and, particularly for Knowles and one other girl in the group, they endured strict diets to keep their weight down. The joy they felt when they were signed to a deal in 1995 with Silent Partner Productions, a division of Elektra Records, turned to bitter disappointment when the deal fell through. In 1997, however, Columbia Records signed the group, which had settled on the name Destiny's Child. They started by recording "Killing Time," a song that appeared on the soundtrack for the blockbuster hit Men in Black. Soon they began working on their first album. In 1998 Destiny's Child—consisting of Knowles, Rowland, LaToya Luckett, and LaTavia Roberson—released their self-titled debut. Their first single, "No No No," found a huge audience, quickly selling over one million copies and reaching the top of the R&B charts. While not a smash hit, the album performed well overall, selling enough to encourage the girls to return to the studio to record a second album. After the release of the first Destiny's Child album, the group was one among many all-female R&B groups jockeying for success, but with The Writing's on the Wall, released in 1999, they shot to superstardom. The first track, "Bills, Bills, Bills," hit number one on the R&B chart and on the pop charts as well. A subsequent song, "Say My Name," performed even better, and in 2000 Destiny's Child won two Grammy Awards. Their newfound success, however, was not enough to keep the group together. Problems concerning money and decision-making powers drove them apart, and Roberson and Luckett left Destiny's Child. They later sued the group and manager Mathew Knowles, a move that created a stir in the media. The new Destiny's Child, now including Farrah Franklin and Michelle Williams, felt frustrated that so many media reports focused on the band's troubles rather than their music. In the end, however, the wave of publicity generated by the controversy resulted in more album sales for the group, and The Writing's on the Wall eventually sold more than eight million copies. Franklin quit Destiny's Child after only a few months, leaving the group a trio. One of the problems voiced by departing members was what they considered Mathew Knowles's unfair emphasis on his daughter's career rather than that of the whole group. Whether because of her father or because of her own talent and ambition, Beyoncé had emerged as the group's most visible member. For the third album, Survivor, she took an expanded role in the writing and producing, and her increased involvement paid off. When the album came out in the spring of 2001, it shot straight to number one on the Billboard 200 album chart, spawning two hit singles with the title track and with "Bootylicious," and winning another Grammy Award. Destiny's Child soon announced that each member would pursue solo projects, although the group, which had sold more than thirty-three million records worldwide, voiced no plans to separate permanently. Beyoncé Knowles performs at the 2003 Nelson Mandela AIDS Benefit Concert in South Africa. In addition to beginning work on a solo album, Knowles began pursuing acting jobs. In 2001 she appeared as the title character in an MTV production called Carmen: The Hip-Hopera, a modern retelling of the nineteenth-century opera Carmen by Georges Bizet. Her next acting job exposed her to millions of filmgoers all over the world. Playing the sassy 1970s-era character Foxxy Cleopatra, Knowles helped Mike Myers capture the bad guys in Austin Powers in Goldmember in 2002. She then obtained a more substantial role in The Fighting Temptations, released in 2003. While the film did not achieve blockbuster status, it did earn more than $30 million at the box office, thanks in large part to Knowles's massive fan base. Aware of the mixed track record of other pop stars crossing over to film, Knowles took her acting seriously, working hard to improve her skills and sincerely hoping to turn in a quality performance. In an article in People, Jonathan Lynn, director of The Fighting Temptations, recalled of Knowles: "On the first day of filming she was a little nervous. She was aware that I might be treating her with kid gloves, so she took me aside and said, 'Make sure you're happy with what you get from me.'" Also in 2003, Knowles released her debut solo recording, Dangerously in Love. With a list of impressive collaborators including Jay-Z, Missy Elliott, Sean Paul, and Big Boi of the hip-hop duo Out-Kast, Knowles used the album to display a side of herself not previously seen by Destiny's Child fans—more mature, more adventurous, and with songs like "Naughty Girl" and "Baby Boy," more sensual. The breakout single, "Crazy in Love," peppered the airwaves, becoming a huge summer hit in 2003. Featuring the rapping of Jay-Z and describing the giddy feeling of falling hard for someone, the song fueled speculation that Knowles and Jay-Z were romantically linked, but the pair kept the relationship under wraps, determined to keep their personal lives private. Entertainment Weekly 's Nancy Miller praised Knowles for exploring a variety of styles on her solo outing, opting to take chances rather than simply continue in the Destiny's Child mode. "While living Dangerously in Love, " Miller reported, "[Knowles] birthed contagious hip-hop dance tracks, '70s-R&B-flavored jams, and garment-rending ballads." The album, released in June of 2003, sold close to three million copies in the United States in its first six months. Knowles was a smash hit overseas as well, with both the "Crazy in Love" single and the album reaching the top of Billboard 's European sales charts. Knowles earned a slew of awards after the release of Dangerously in Love, taking home five Grammy Awards in 2004, including Best Contemporary R&B Album. Her five statues put her in fine company: only Lauryn Hill, Alicia Keys, and Norah Jones had won that many Grammy Awards in a single year. During 2004 the National Association for the Advancement of Colored People (NAACP) nominated Knowles for five Image Awards, giving her their Entertainer of the Year honor. Knowles's accomplishments have been considerable, but so are her expectations. In an interview with CosmoGirl! she explained that her ultimate goal is to be thought of as a legend. In response to the question of what makes a celebrity into a legend, Knowles told CosmoGirl! : "When you say her name, what you think about is her star quality. She is a good person, has good spirit, and is more than just a person who performs and sells records. She's a person who will change your life." Knowles may be too young to be described as a legend, but she has joined the elite ranks of Madonna, Cher, and other single-named stars, becoming known to millions of fans simply as "Beyoncé." Chocano, Carina. "Destiny Awaits." Entertainment Weekly (May 30, 2003): p. 34. Feiwell, Jill. "Working on a Dual Destiny." Daily Variety (March 5, 2004): p. A8. Mayo, Kierna. "Beyoncé Unwrapped." Essence (August 2003): p. 122. Miller, Nancy. "Beyoncé: Love Child." Entertainment Weekly (December 26, 2003): p. 32. Rosenberg, Carissa. "Above and Beyoncé." CosmoGirl! (September 2002): p. 139. Sexton, Paul. "Charts Show Europe's 'in Love' with Beyoncé." Billboard Bulletin (July 25, 2003): p. 1. Tauber, Michelle. "Destiny's Woman." People (October 6, 2003): p. 87. "About Solange." Solange. http://www.solangemusic.com/ (accessed June 26, 2004). "Beyoncé." All Music Guide. http://www.allmusic.com (accessed on June 24, 2004). "Biography." Beyoncé. http://www.beyonceonline.com/ (accessed on June 25, 2004). After reading the aarticles about beyonce, i find it really intresting where i get to know her family background. And i was able to know how was she able to secure her carrer untill today.